A member of the development team nicknamed Zeo, living in south California sent me an email asking help to solve an issue. In his spare time he was migrating a web store application in Java/Spring 3.1 to the Google App Engine. One of the requirements was to integrate Express Checkout API to streamline the checkout process for buyers of digital goods. 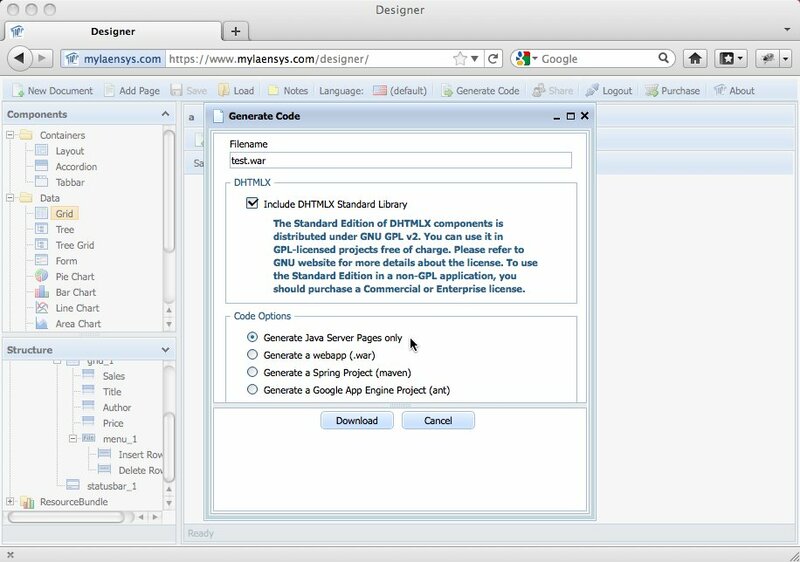 PayPal X delivers an open source java toolkit for Google App Engine available on Google Code named paypalx-gae-toolkit, which provides support for the Adaptive Payments APIs. Unfortunatly using the Adaptive Payments API, PayPal redirect page is not designed for mobile, so it creates a bad user experience. Googling the internet Zeo found an entry in the x.commerce forum which talk about this issue. Currently PayPal don't have a mobile version of Adaptive Checkout, we only provide a full web flow or the embedded checkout flow (lightbox). At the moment the only mobile web solution PayPal offers is Mobile Express Checkout. One alternative is to have the customers sign up to a preApproval, once they set that up you can charge their PayPal account without the need for a redirect to PayPal for each payment. The main issue again with this is that there is no mobile friendly PreApproval flow. In addition, after reviewing the source code developed by Zeo I realized that most of the application use the Paypal NVP HTTP API to interface the Express Checkout and to adopt the Paypalx GAE toolkit would require major changes to the application and would provide limited support for mobile devices. 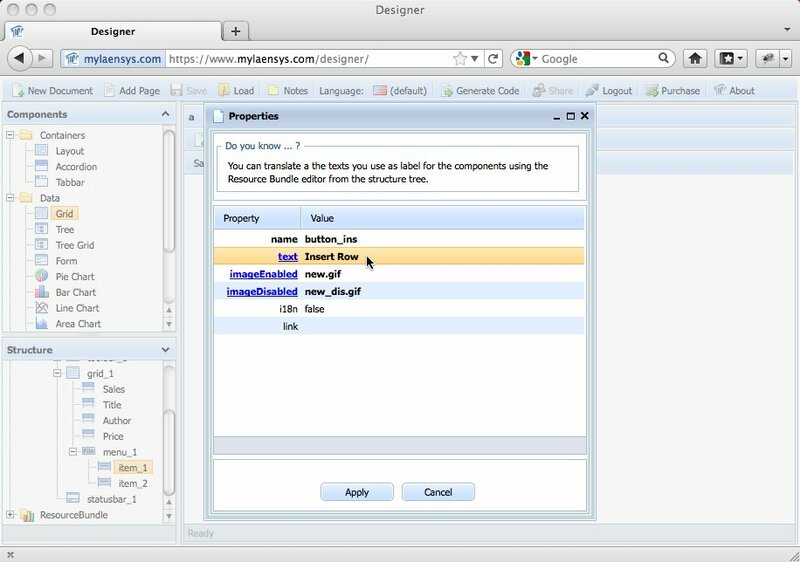 Basically it replaces the xerces parser with the SAX Parser included with the Java SDK, which removes the dependency from the library delivered with the Paypal SDK. One less library that needs to be included in the application WEB-INF/lib. The second issue related to the Google app engine “Black List” , in other words, Java APIs that did not work on GAE. In this case the issue was related to the Apache Http Client dependency, because of the NVPClientSocket class. .
Also in this case, a solution was to remove the dependency from the Apache Http Library (what a shame) and use the Google App Engine's URL fetch service. Another change, was to remove the NVPSSLSocketFactory.java and all the references to the org.apache.commons.httpclient. * in the code. I packed the changes in a new paypal-base-gae.jar and sent to Zeo to test on the web store: it worked. I explained to Zeo this solution is a workaround, and does not pretend to be "the solution" to run the Paypal API on GAE. He promised me next time I will be in South California we will grab a burger at one of my favorite places Hodads. A couple of weeks ago, we were involved in a discussion between users and technicians about transaction integrity for a hypothetical system. The preferred approach of the technicians was the optimistic locking: when a user edits the data and saves the changes while another user contemporarily changes the same data, an error is returned. Users did not take this kindly, because the changes are lost and they need to repeat the operation. We started to think out of the box in order to get a different solution, and borrowing the SAMCRO acronym from our preferred TV series, we created a new meaning: Simultaneous Asynchronous Multi Client Read Operation. Like the spirit of the TV series, where your mother says don't do something and you do it anyway, the result is a good practical application of the Google App Engine Channel API. Do not try it on your production environment. Before getting started, buy your favorite burrito and call your best friend asking five minutes of their time to participate in the exercise below. Next, both of you connect to http://gae-samcro.appspot.com with Firefox/Crome/Safari web browser (IE may not work).The screenshot below should be displayed. 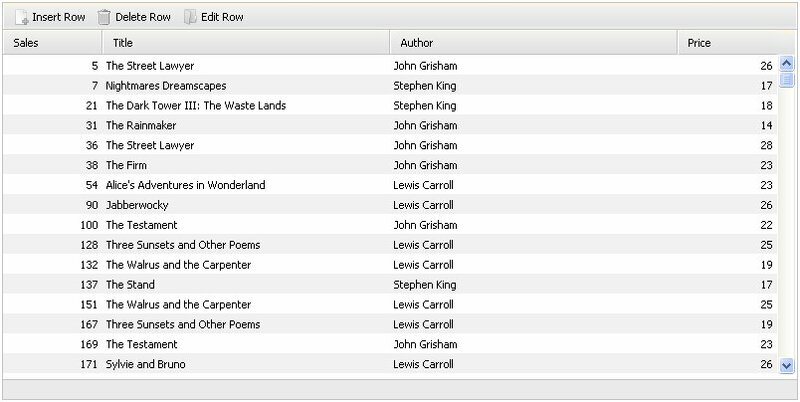 A brief explanation about how it works: by clicking on the rows in the list (left window) the detail window (on the right), shows the detail data of the selected row. To update a record, change the values in the edit box and push the 'Update' button. 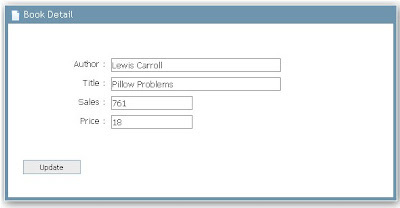 Now select a row and ask your best friend to select the same row. 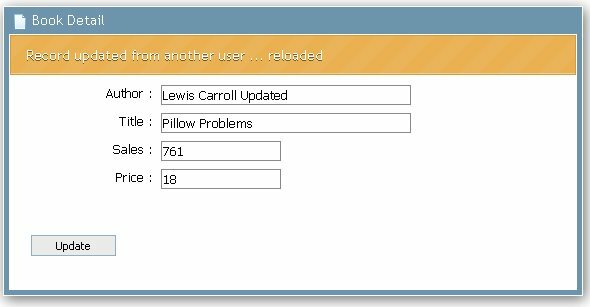 Change some of the values in the detail window (for example typing in the title field) and save the data by clicking the Update button. If you are lucky, you should get the screenshot below; if not try reloading the page, as sometimes it takes a while, like putting a car in first gear. 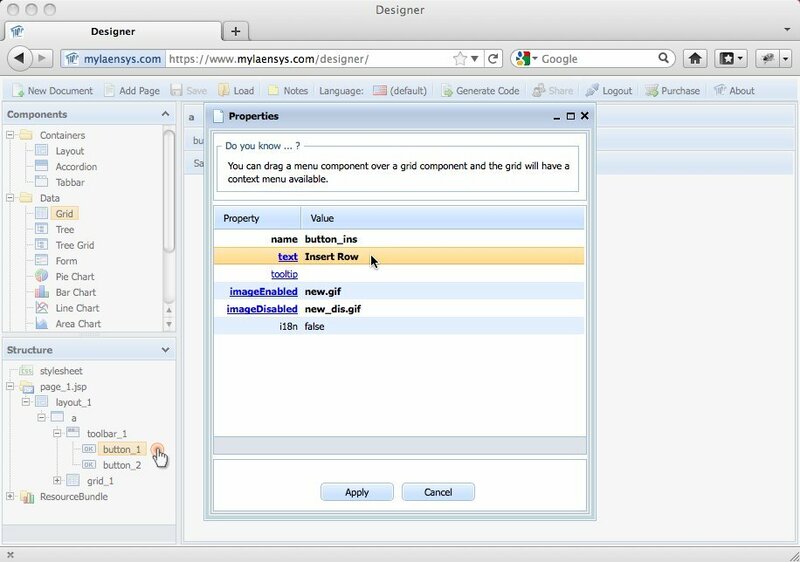 The Google App Engine Channel API has been released, starting from the SDK 1.4.0. A mandatory operation consists of initializing the channel. On client side you need to send a request to the server to initialize the channel. 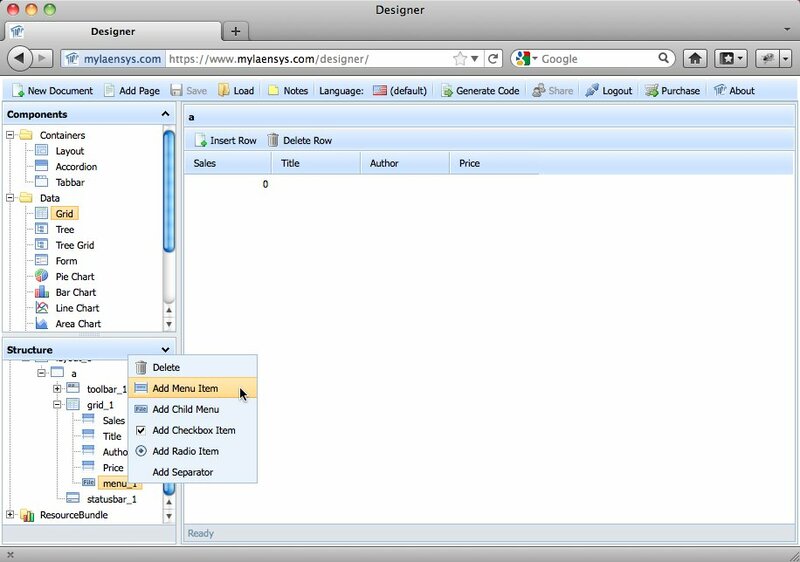 In this sample application, the session ID is used as client ID, and it is stored in the datastore. 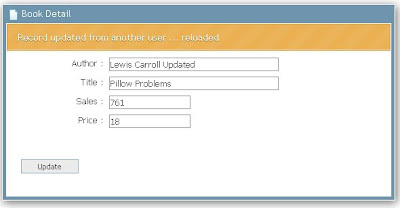 On client side, the notifyToChannel is used to send messages to the client. 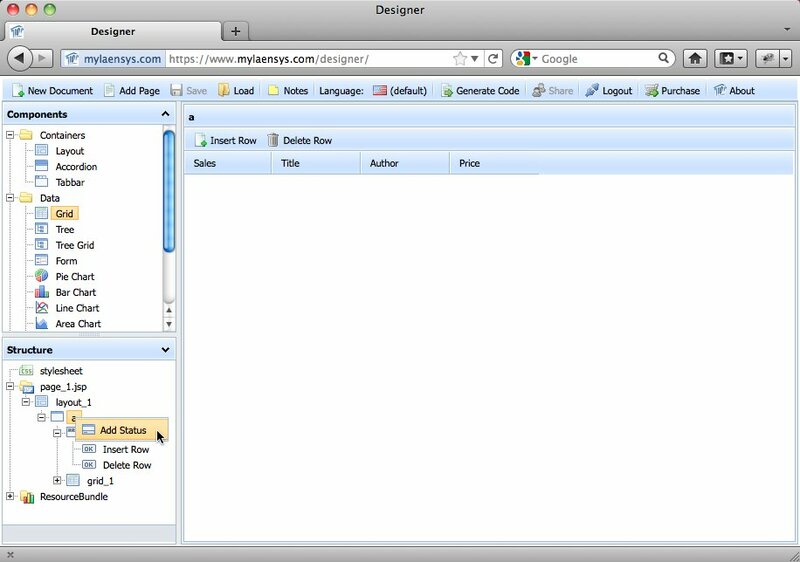 In this case an Ajax GET request is sent to the server. The onMessage function specified during the initialization is invoked when a message is received from the client, in this case a JSON message. On server side the message is dispatched to clients via their channels. When the channel_presence is enabled, the application receives a POST /_ah/channel/connected/ request when a client has connected to the channel, and receive a POST /_ah/channel/disconnected/ when the client has disconnected. 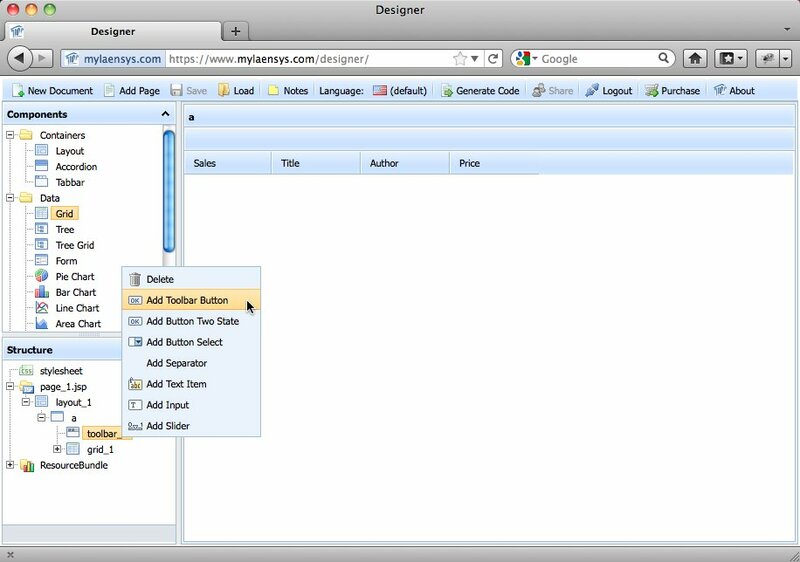 This sample application implements handlers to these paths in order to keep track which clients are currently connected. The sample application has been developed in Java with the support of the DHTMLX Java Tag Library 1.5 the DHTMLX Java Tag Designer and DHTMLX 3.0. Gaelyk templates are really just one view option. 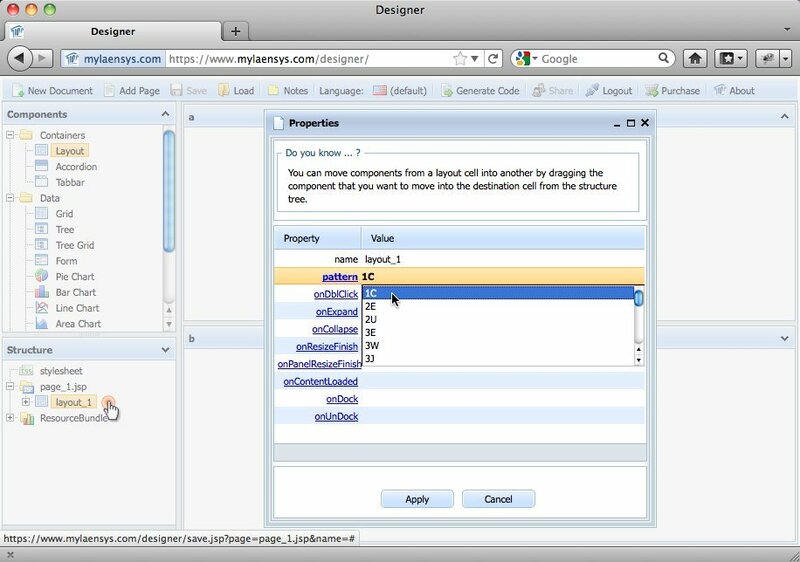 You can still continue using Groovlets, but delegate to JSP views, using JSP taglibs. Gaelyk doesn't try to reinvent the wheel here. 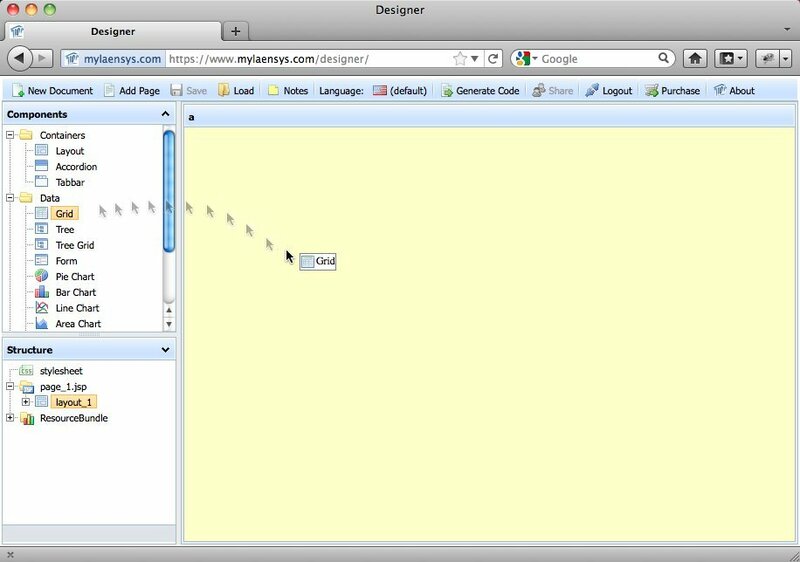 Gaelyk provides templates (GTPL) similar to JSPs, which are pages containing scriptlets of code. 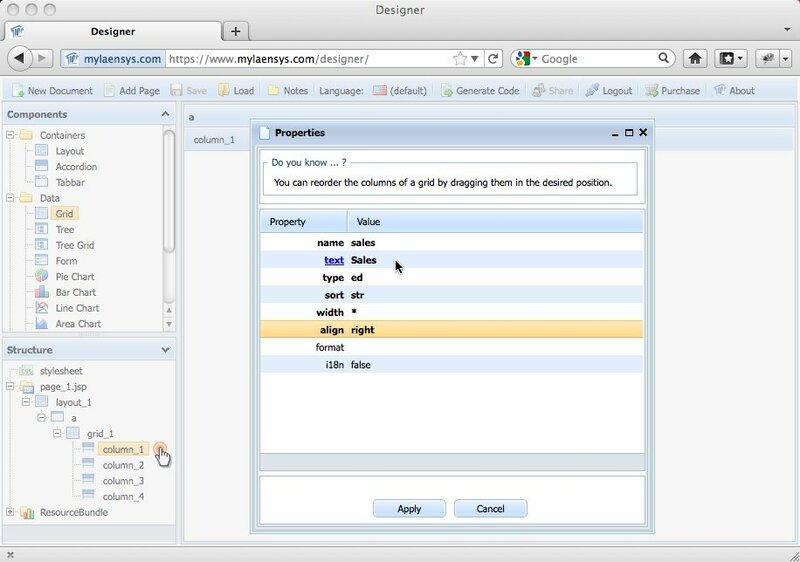 In the same way in which you can mix Java and Groovy code for classes, Gaelyk let you use a combination of GTPL and JSP pages. Both pages have been created using the DHTMLX Tag Designer, which makes it pretty simple to prototype the layout. The initialization attaches a handler to the onButtonClick form button event, which updates the message on top of the form, and posts the save operation to the application. The second step of the code sets up the validation, binding validators to the object form fields, and provides the onBeforeValidate and onValidateError event handlers to update the text message box. 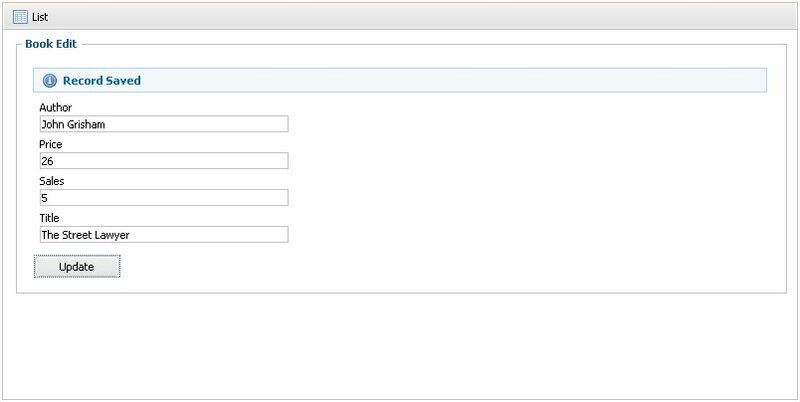 The final step invokes the load method on the form, it triggers an Ajax call to the book Groovlet to retrieve the data and fill the form. In the case above, path variables are translated in order to route different task to a single Groovlet. The book.groovy Groovlet performs the list, show and edit operations. log.info "list : getting book list "
= params.orderby ? 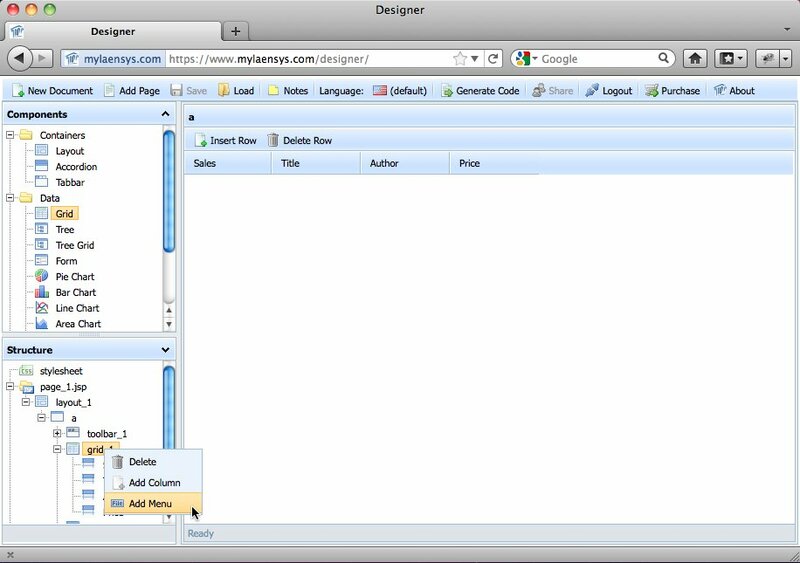 params.orderby : "sales"
params.order = params.dir ? (params.dir == "des" ? "desc" : "asc") : "asc"
log.info "edit: editing a book"
log.info "show: getting book data"
The data processor POST requests are routed to the Groovlet named processor.groovy, which handles the insert, update, delete operations, and persist changes to the entity. Gaelyk’s abstractions for the datastore make them quite straight forward to implement. 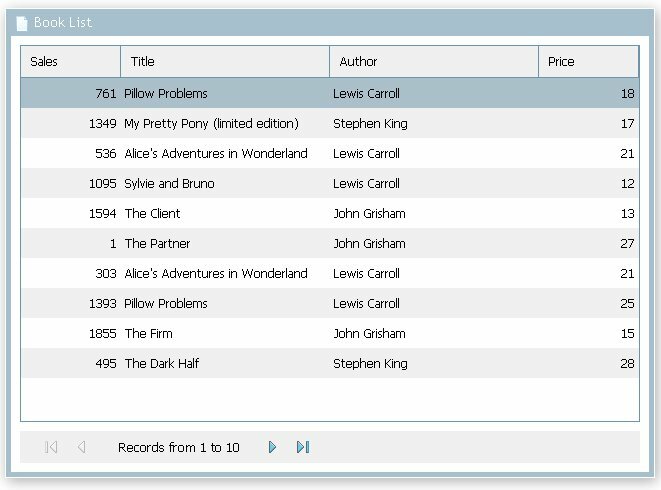 log.info "inserted: inserting a book"
log.info "updated: updating a book"
log.info "deleted: deleting a book"
Keeping thousand of records in a data grid is a common requirement for most applications. Smart Rendering increases overall performance with big amounts of data, activating a dynamic loading to fetch data from the server when needed. In the great book Designing Web Interface, written by Bill Scott and Theresa Neil, they underline the value of the Make It Direct principle, allowing the user to directly edit content in place. The Fitts's Law highlights the value to keep the tools close, to improve the user interaction. 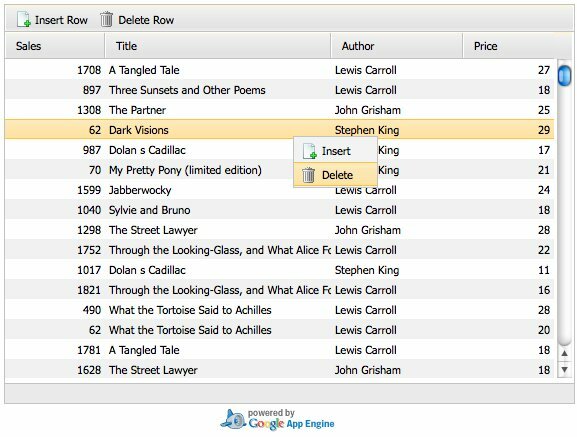 This principle has been applied providing a context menu, so that the user can select a row and access the related functions (delete and insert in this case) using the right click. To create the user interface the DHTMLX Java Tag Designer has been used (useful but not mandatory). You can find step by step instructions here. Below the HTML code of the page. 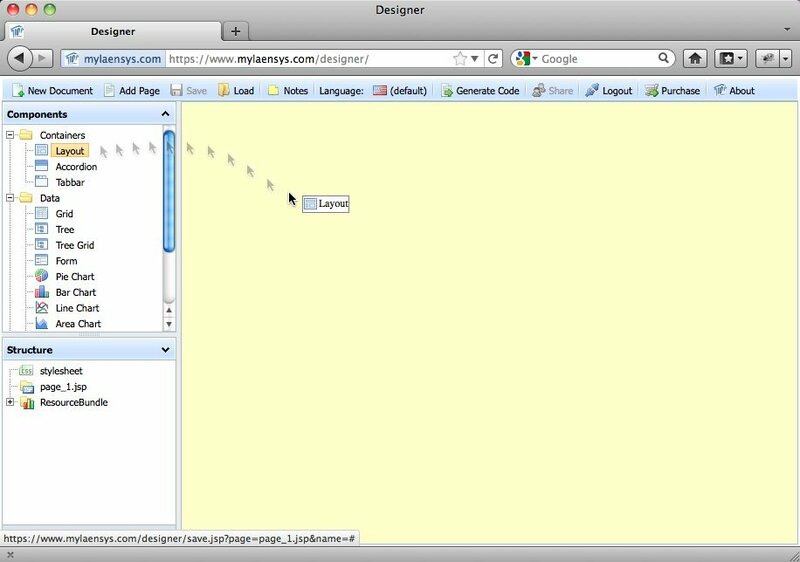 The user interface is declared within the <dhtmlx:body> tags, using a Layout component as container for the Toolbar, Status Bar, and Grid. 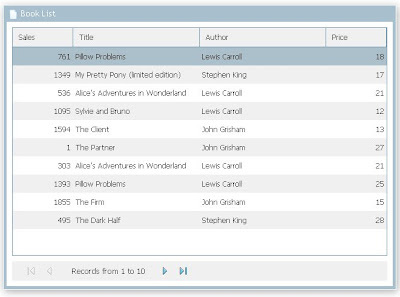 In first step, the event handlers for toolbar and menu are attached to the components. The initialization proceed with the grid setup, enabling the SmartRendering, setting up the validation, and loading the data. OnBeforeSorting event handler attached to the grid provides the support for server side sort processing. Last step of initialization, is the data processor configuration, which takes care to send back to the server updates that occurred on the grid; calling enableDataNames ensures that the column names will be included as parameters in the POST request. 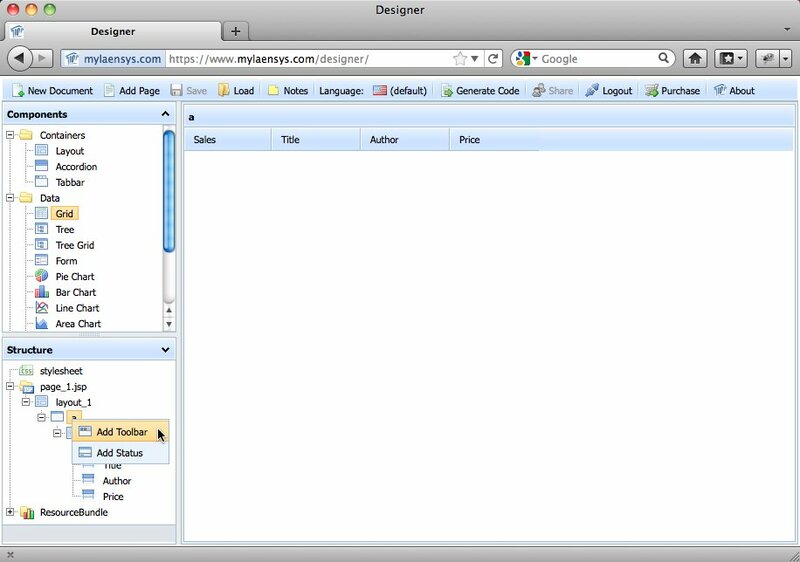 The load_data function resets the grid component and sends an ajax request (GET) to the server to retrieve the data. 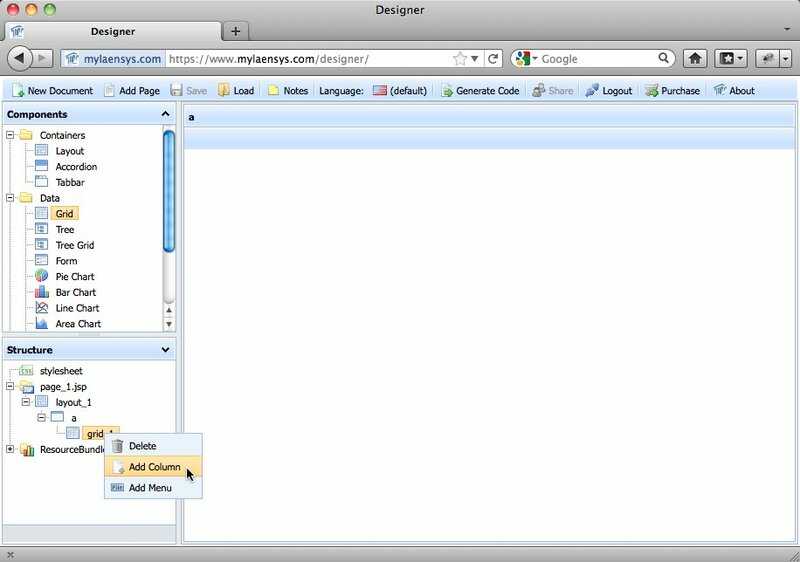 The on_click detects which button or menu item has been selected by the user and performs the corresponding operation. On the server side, the Java class Book is annotated for persistence, getter and setter omitted for short. You can see that the names of the attributes match the names of the columns. 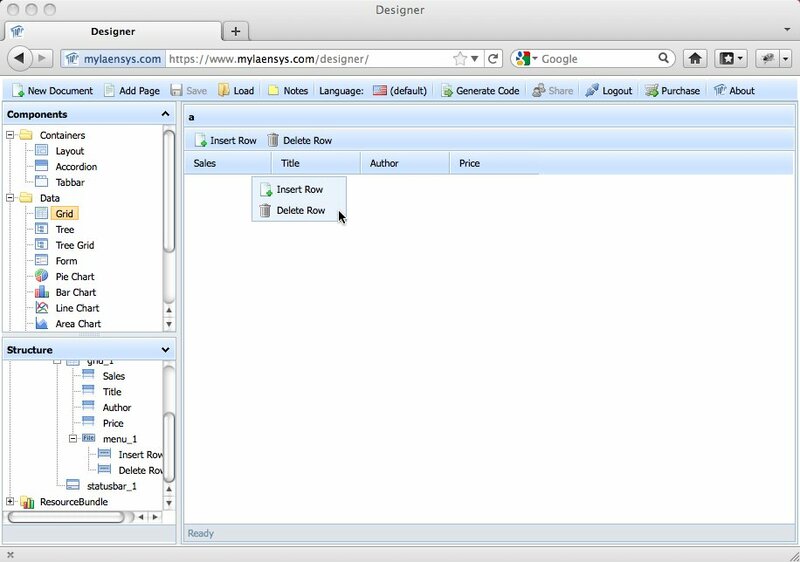 The doGet method of the servlet retrieves the data and feeds the grid. 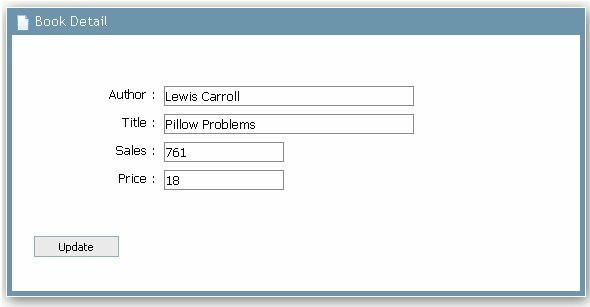 The smart rendering option, enabled during grid initialization, adds as parameters the starting position of the record (posStart) and the number of records to be returned (count). The doGet method processes these parameters plus sort parameters, if any, executes the query on the data store, and returns the retrieved rows as XML. DHTMLX data processor component has its own protocol to exchange information with the server (additional information is available on DHTMLX website). This sample implementation, detects the operation triggered by the data processor and performs the appropriate data store operation.